Ah, time for a post to reveal just how much of a fan collector I am (although this is probably nothing on Jamie's collection). Top row: The Warlock of Firetop Mountain (wraparound cover - 1st edition); Puffin #1~7 (coloured star versions); Puffin #1~24 (zig-zag versions) with a second copy of The Citadel of Chaos with the Ian Miller cover and a copy of House of Hell without the excised illustration. 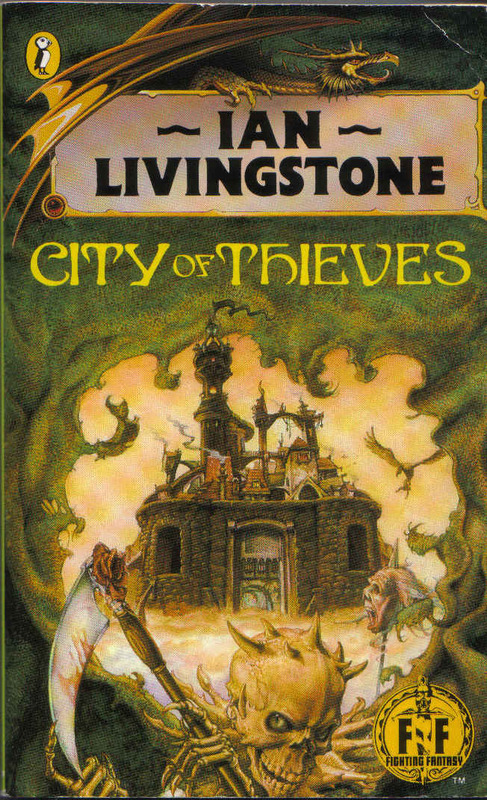 There follows Puffin books #5, 6, 8~21 (Golden Dragon versions with number on front cover). Second row: Golden Dragon with number cover versions continues with books #22~36; then the Puffin versions with no numbers in the Golden Dragon format with books #4, 7, 10, 13, 15, 21, 24, 27, 30, 37~39; then the Golden Dragon versions with the number only on the spine for books #1~3, 7, 9~12, 15, 16, 18~24, 26, 28~30. Third row: The Puffin Golden Dragon number only spine versions continue with books #31, 33, 35~51 along with a second version of Master of Chaos with the map by Leo Hartas. The comes the final Puffin editions which are the Golden Dragon format without the foil for which I have books #1~4, 10~14, 17, 22, 24, 33, 42, 44, 46~58. Fourth row: The final Puffin book Curse of the Mummy; followed by the Clash of the Princes box set; the coloured star and Golden Dragon with foil versions of Fighting Fantasy – The Role-playing Game; and the zig-zag version of The Riddling Reaver. The follows Wizard Books versions from "Series 1" beginning with the "Sample Version" of The Warlock of Firetop Mountain; and continuing with the "Standard Editions" of books #1~6, 8~10, 15, 17, 20, 21, 26; then the "Special Editions" of books #3~12, 16, 18, 19, 22~29; and then the 25th Anniversary Edition of The Warlock of Firetop Mountain. The row ends with the foil version of the first three novels from Puffin. Bottom row: The UK versions of all 4 Adventures of Goldhawk and the US version of book #2 The Demon Spider; then the 10th Anniversary Yearbook; the Sorcery! boxset of The Shamutanti Hills and The Sorcery Spell Book; followed by the "coloured triangle" version of The Shamutanti Hills and the edition of the Spell Book that was sold seperately; with the zig-zag versions of all 4 Sorcery! books next. 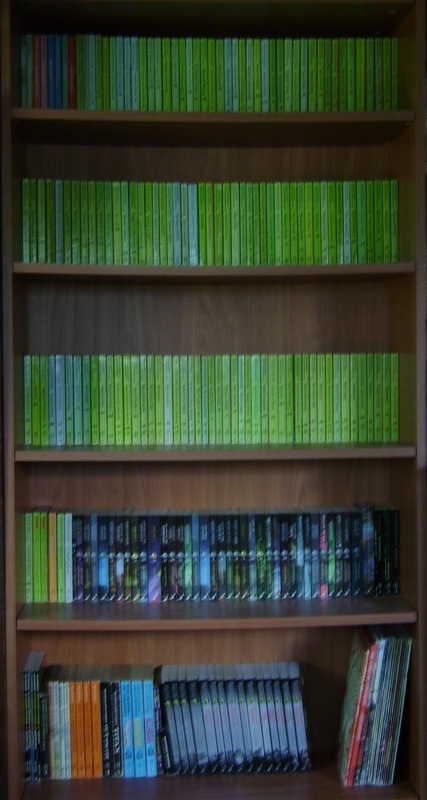 There follows the B5-sized versions of Out of the Pit and Titan and the three Advanced Fighting Fantasy books (the first two being the foil versions). My only novel from The Zagor Chronicles quartet is next along with the Deathtrap Dungeon Card Game. 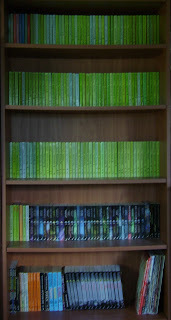 Then is the Wizard Books "Series 2" editions of which I have books #1~9, 11~16. Winding up this post and the final row is the paperback and hardback versions of The Tasks of Tantalon, the A4-sized editions of Out of the Pit and Titan and Warlock magazine issues #1~13.